Vintage Stoneware Wild Strawberry Korean Mug. Very good condition. Dispatched with Royal Mail 2nd Class. Staffordshire Potteries Red/Orange Flowers Mug in used condition. Dispatched with Royal Mail 2nd Class. Blue inside. Pre used, but in very good condition. 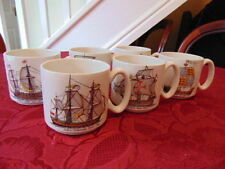 4 Mugs from by Churchill from the Jeff Banks 'Ports of Call' design 'Herat' - good used condition. Ports of Call, Zarand. 2 coffee cups and saucers, 2 mugs and lidded sugar bowl. A beautiful little collection from renowned producers with the added sophistication of Jeff Banks design. Immaculate with no chips or cracks what so ever. You may wish to browse other items I have for sale including other tableware, glassware, pottery, glassware etc etc. Most items are despatched within two days after payment is received. For sale I have two lovely mugs probably dating from the early 1970s. The second mug is brown with a funky floral design in olive green and red. 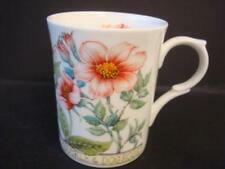 The first mug is white with a great floral design in brown. In good condition with minor age/use related wear as to be expected. 6 X Churchill ports of call Herat mugs by Jeff banks, (proper mugs not those skinny things ) all in excellent condition, fully backstamped, size approx 3.5" high X 3" dia. Very nice mug. Has a couple of tiny kind of scratches, hardly noticable. 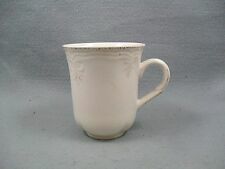 TOSCANA Tea / Coffee Mug Excellent Condition. Royal Stafford. This Sale is for 3 Mug. 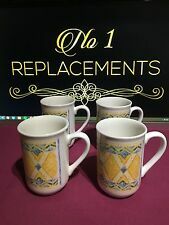 CHURCHILL Somerset Fruits Mugs x 3 The mugs measures 2 3/4" in diameter and 4 1/4" deep They are in excellent condition with no cracks or utensil marks one mug has a small chip to the base but cannot be seen when resting. Thank you for looking. 6 x mugs & saucers in very good condition. This antique pealware Staffordshire mug has been hand decorated with blue and gold stripes. Mug still displays nicely however entire mug has significant glaze crazing all over and visible ageing. Purely for decorative purposes only. THREE Vintage Charming Robin, Kestrel & Heron Decorated English Ironstone Tableware Mugs. That's £2 each! In Excellent Condition No Chips Nibbles Cracks or Crazing. Height 4" & 3.75', diameter 3'. B18. Reasonable offers considered. Price is for 6x Churchill hyrangea. ​Mum in a Million. In very good condition. Both mugs are in great condition - one is mint, the other is near mint with just a tiny fleabite to the base (shown in the 3rd photo). Lydae09 ( 144. Great addition to your collection. DENBY LORRAINE TEA SET 14 PIECES (#201606610294) £26.99 View Item. uk2015_snee ( 33. Poole Pottery Twintone Mushroom / Sepia Dinner Plates x 4 (#201614890509) £15.99 View Item. ). SAIREY GAMP MUG. Comical New Hall Hanley. Staffordshire England. chip on rim shown in pic 1. Churchill, Blue Willow, Dream Mugs x 2. Back Stamped: Churchill, Fine China, Microwave & Dishwasher Safe. Flower / Kingfisher on other one. TEA & TOAST MUGS. Lovely designs. Flower & Fox Design on one. In very good condition. I will do everything in my power to make sure you have a pleasant experience. These lovely mugs feature a forward facing skull on a plain background, – and were proudly made in the heart of the English Potteries. Pick up from us. Combined Orders. Pair of lovely staffordshire mugs blue & black interiors. 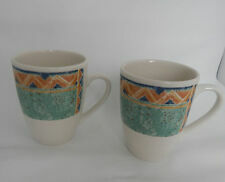 Pair of lovely Staffordshire mugs blue & black interiors..nice condition no chips cracks or defects. Dispatched with Royal Mail 2nd Class. Around 10cm Tall, 7.5cm Wide. Perfection cannot be expected. Best wishes. Another has a small hairline crack in handle which does not go all the way through the handle. I am not too sure of the exact age date this was made, but I would suggest that it may date from circa the 1960s / 1970s. 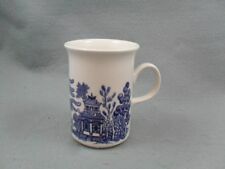 A Cornish Ware Style Blue and White Striped Mug by T.G. Green Ltd. It was designed by Martin Hunt, for Green's Channel Isles Designs. Staffordshire Tableware. Fine Bone China Mugs. Lovely oriental, floral patterns. Fine Bone China. The 2 with the birds have 'J' on the base. Made in England. It has gilding to the top & bottom rims and also to the handle which is a bit rubbed (see pic). 11.5 cm high x 9 cm dia top. If you would like to collect I am in North Dorset. Back Stamped: Cath Kidston Exclusively by Queen's, Fine China China. In good condition. Height 10cm. YOU WILL RECEIVE TWO MUGS. BILTONS [MADE IN ENGLAND] MUG. 10CM TALL/8CM DIA. CREAM RED FLORAL/LEAF DESIGN. 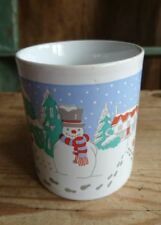 4 Churchill Pottery vintage porcelain tartan mugs boxed mint condition unused?